A cooking apple, or culinary apple is an apple that is used primarily for cooking, as opposed to a dessert apple, which is eaten raw. Cooking apples are generally larger, and can be tarter than dessert varieties. Some varieties have a firm flesh that does not break down much when cooked. Culinary varieties with a high acid content produce froth when cooked, which is desirable for some recipes. Britain grows a large range of apples specifically for cooking. Worldwide, dual-purpose varieties (for both cooking and eating raw) are more widely grown. Apples can be cooked down into sauce, apple butter, or fruit preserves. They can be baked in an oven and served with custard, and made into pies or apple crumble. In the UK roast pork is commonly served with cold apple sauce made from boiled and mashed apples. 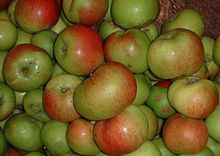 Bramley apple is by far the most popular cooking apple in the United Kingdom, while Granny Smith may be the most popular in the United States and Australia (where it originated). A baked apple is one that has been baked in an oven until it has become soft. The core is usually removed and often the resulting cavity is stuffed with other fruits, brown sugar, raisins, or cinnamon, sometimes with a liquor such as brandy. Properties of a good apple — Apples for table are characterised by a firm pulp, elevated, poignant flavour, regular form, and beautiful colouring; those for kitchen use by the property of falling as it is technically termed, or forming in general a pulpy mass of equal consistency when baked or boiled, and by a large size. Some sorts of apples have the property of falling when green, as the Keswick, Carlisle, Hawthornden, and other codlins; and some only after being ripe, as the russet tribes. Those which have this property when green are particularly valuable for affording sauces to geese early in the season, and for succeeding the gooseberry in tarts. It is often believed that eating cooking apples raw will make a person sick. In reality cooking apples are harmless raw and are just varieties of apples whose characteristics are well suited to cooking. This myth is simply a product of cooking apples' tart taste and the possibility of it not sitting well in the stomach. ^ Robert Hogg: The Fruit Manual.... 2nd ed. (London: 1862). Retrieved 22 February 2016. ^ Fertig, Judith M. (2011). Prairie Home Cooking. Houghton Mifflin Harcourt. p. 69. ISBN 1558325824. ^ a b Thomas, Harry Higgott (1902). The Book of the Apple. J. Lane. p. 71. ^ Mulvihill, Mary (2003). Ingenious Ireland. Simon and Schuster. p. 135. ISBN 0684020947. ^ DK Publishing (contributor) (2012). Cooking Season by Season. Penguin. p. 335. ISBN 1465405186. ^ a b c d e f Platt, Rutherford (2014). 1001 Questions Answered About Trees. Courier Dover Publications. p. 169. ISBN 048616781X. ^ Weathers, John (1901). A Practical Guide to Garden Plants. Longmans, Green. pp. 1056–1059. ^ Knox County Farm Bureau Bulletin. The Bureau. 1922. p. 6. ^ Gordon, Don. Growing Fruit in the Upper Midwest. U of Minnesota Press. p. 47. ISBN 1452901066. This page was last edited on 22 December 2018, at 19:55 (UTC).